For the most part, my neighborhood is tastefully decorated for the holidays in restrained strands of white lights and only the occasional fauxflake. (I wanted to take a picture of our front yard for the blog, but yesterday I had the sudden realization that Austin is a small town of distinct neighborhoods, and I don't really want any cyber stalking psycho killers to sneak in and chop me up into little bits while I'm sleeping. Perhaps I have been watching too much Dexter. ) 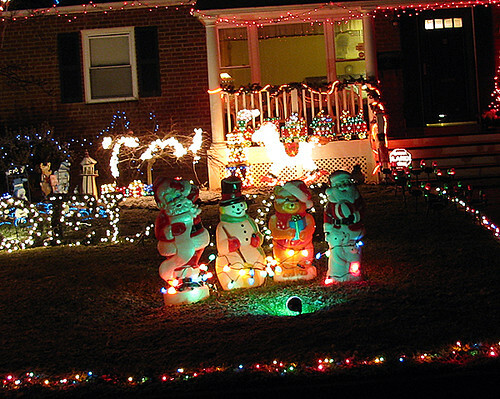 I like that our house looks neat and tidy, but I was hoping one of our neighbors would go insane with the colored lights set to induce epileptic seizures, animatronic reindeer, and inflatable snow globes with Santas trapped inside for all eternity like Superman's dad on Kal-el. Or whatever. I just wanted some drama, you know? 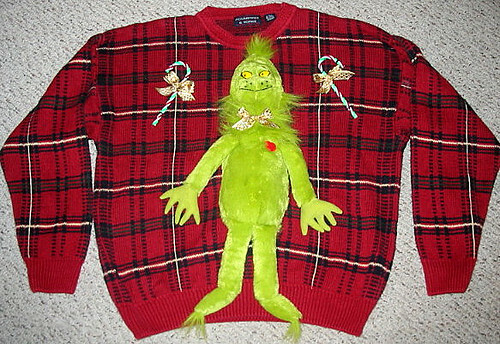 So today I am jettisoning all semblance of taste to bring you some tacky Christmas bling blung. You can always count on me to klass up your morning. 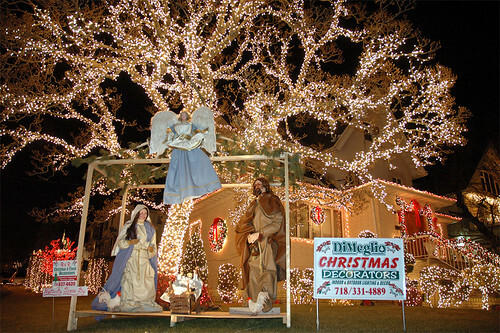 If I lived in the swank neighborhood of Dyker Heights in Brooklyn, I could hire these folks to jazz up my yard. The tree is pretty rad, actually, but I am not feeling the creepy creche. 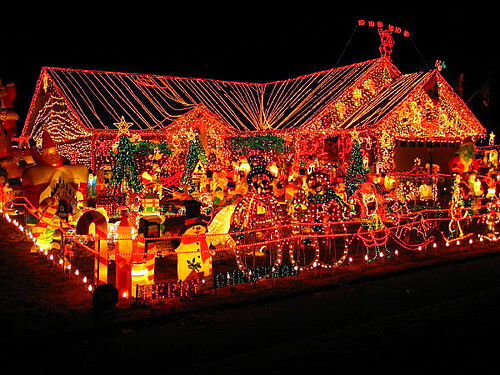 Plus it must cost a boatload to have your house done up like so. Like, enough to buy two Wiis. 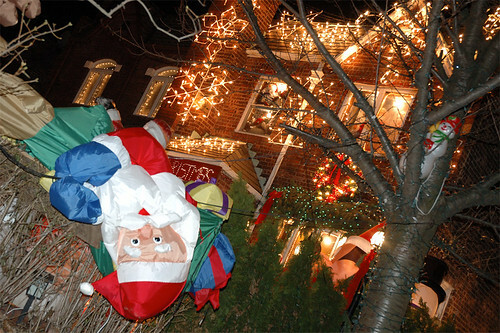 It's obviously a case of keeping up with the Joneses, though, because the entire neighborhood looks like Santa got a little airsick and made a few special deliveries. Or maybe he just had a bit too much of the spiked nog? A reminder that there are bigger, bolder forces than Santa at work here: perhaps we should lay the blame for this one squarely on the mouse. 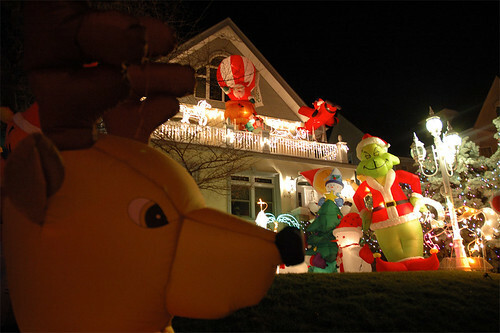 I think the reindeer has plans to take the Grinch out... for the greater good, of course. 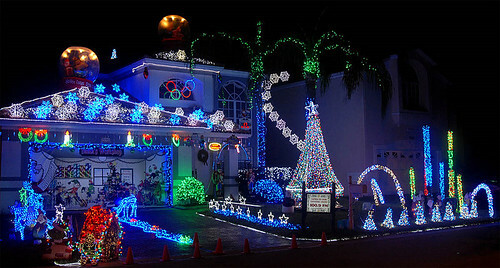 Meanwhile, in Ft. Lauderdale, this family is "putting Christ back in Christmas" by setting their 60,000 LED lights to DANCE to Emerson, Lake and Palmer's, "Nutrocker." Hopefully he can rustle up the liquid assets to purchase enough electricity to power this baby. You know -- completely random small ornaments tacked on at completely random places with no sense of an overall scheme. 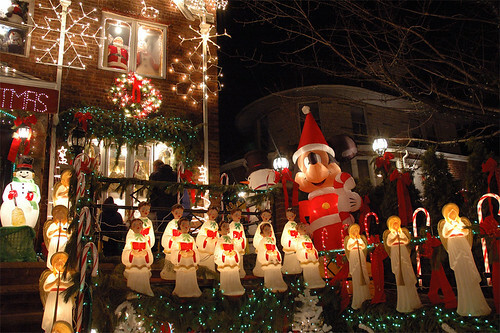 It appeals to my sense of homeyness much more than the Dyker Heights hood, quite frankly. So does this one. Ah, yes. Whither the humble plastic statue, lit from underneath to spotlight evil Santa who just wants to have a little holiday fun? My advice: keep to the lit path, friends. 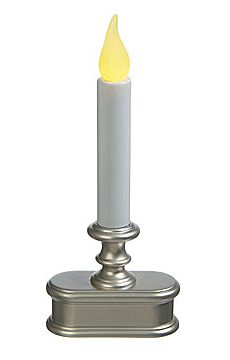 You don't want to lose a leg in a Christmas "accident." Some people accrue so many decorations over the years that they have to build a corral to keep them from escaping. This beauty was featured in Park Cities People, which is a local paper that also serves the Preston Hollow neighborhood in Dallas, future home to one George W. Bush. Wouldn't it be hilarious if G Dub's neighbor was responsible for this? The power drain on the local grid alone might compromise security. Oh deer. 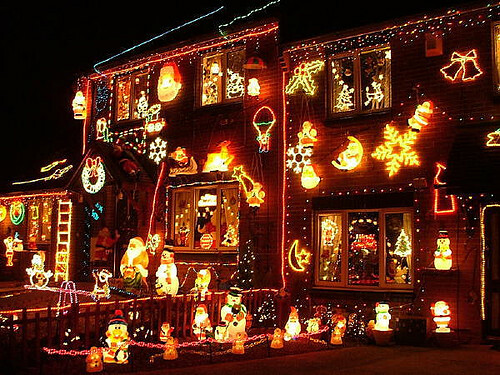 If you're feeling the recession pinch and don't have the cash to purchase 500,000 lights, or if you are even vaguely eco conscious, you could just dial the holiday fervor down a notch. I really hope that reindeer sings siren songs about ice cream and cookies. 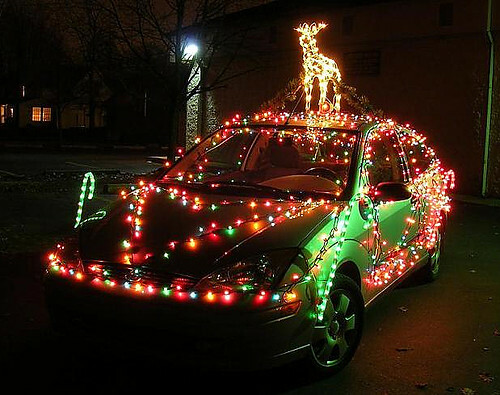 With a display like that, homeboy best be serving up some treats from the hatchback. Well, dear readers, Karly and I will be taking next week off to indulge in holiday shopping, eating and general gluttony, but we'll be running some super sweet vintage posts sure to dazzle all but the 5 of you who have been reading DC since the verrrrry beginning. 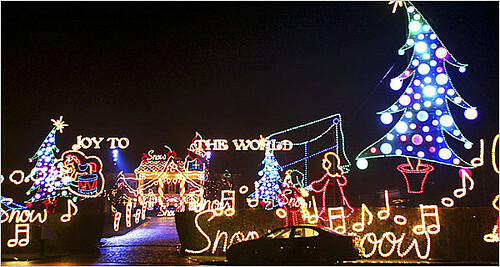 In the meantime, have a fantastic holiday break full of animatronic deer and inflatable Santas!! !